Height 90cm (3'). Easy to grow. HA - Hardy annual. Low growing variety. Rob's SPILLERS - Spillers can either fall away from the main arrangement down the sides, or they can spike up and out of the arrangement. They help create depth to the other flowers and help it feel more natural. Sow in pots or boxes from January-March in a cool greenhouse, planting out 15cm (6") apart during late March-early June, after hardening off. Seeds can also be sown 2.5cm (1") deep outdoors from March-May, the final spacing of the plants being 23cm (9") apart. 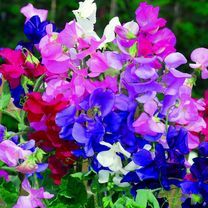 Alternatively you can sow September-October for earlier flowering the following year. Ideal climber. Scented. Attractive to bees. Suitable for cut flowers. Prefers full sun. Some varieties have hard black seeds and we advise soaking them in water for eight hours before sowing. Try growing gypsophila to complement your cut sweet peas. Pick sweet peas continuously so that you ensure a summer-long display.